Joey Manfredo specializes in environment program management, communications, and training design and facilitation, with a focus on climate change adaptation in small island states. 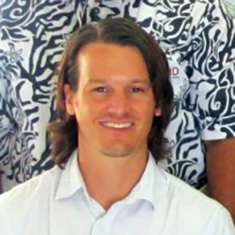 Since October 2015 he has served as Deputy Chief of Party for the Coastal Community Adaptation Project (C-CAP), a U.S. Agency for International Development (USAID) four-year initiative to support climate change adaptation and disaster risk management in nine Pacific Island countries. He leads project communications and operations and supports technical implementation with a focus on training and capacity-building activities. Joey joined DAI in 2011. Prior to his full-time role with C-CAP, he managed the technical and operational aspects of environment projects and new business acquisition in the Asia-Pacific region. His Pacific Islands experience dates to 2005 when he served as a Peace Corps Volunteer for three years in the Kingdom of Tonga. In addition to his native English, he speaks Tongan with business proficiency. Prior to his international development work, he was an account executive for Philadelphia-based Simon Public Relations Group, where he managed media relations and editorial content for nonprofit clients.